This is a fantastic book! Get yourself a copy! I did already know I was going to be interested, I had heard the authors discuss the book with Patricia Karvelas in The Drawing Room on Radio National. I knew it wasn’t yet another book about the science of climate change so that you can have arguments with climate change deniers, it was, as the title implies, a book about what to do to make life bearable now that climate change is upon us. How to make your life better in the 2° rise-in-temperature scenario, which is now inescapable. How to prepare for that, because it’s happening in your lifetime, in your own little house in the suburbs or wherever. Yes, present tense, not future tense. Noticeable changes now, and only going to get worse even if a miracle happened and our witless politicians started doing something to prevent it getting to the 4° rise-in-temperature scenario. But, well, I admit it, I was expecting The Handbook to be a bit worthy. I was expecting it to be a bit dull. I should have known better. I hadn’t heard of Whitmore before (he edits the Environment pages at The Conversation) but Jane Rawson (who used to do the same thing) is the author of A Wrong Turn at the Office of Unmade Lists which won the 2014 Aurealis Award and the Most Underrated Book Award (see my review), and she’s just won the 2015 Seizure Prize for a macabre novella called Formaldehyde, so she’s never going to write anything dull. Although a serious book, The Handbook is really interesting to read and in some places will even make you chuckle. It’s a mixture of things any intelligent person could predict will happen when temperatures rise (e.g. you will use your air-conditioner more and your power bills will go up; there will be even more bushfires and floods and you may lose your house and belongings, that’s if it doesn’t kill you) – and things you might not have thought about, like food shortages because storms have wiped out the crop and Australia’s heavily centralised food distribution system has failed because the roads have been washed away. Nobody starved during the 2011 Queensland floods, but the Department of Agriculture, Forestry and Fisheries report made some rather chilling conclusions. It turns out that Queenslanders got very lucky. There are a number of factors which make Australia’s food supply vulnerable to disasters. Over recent decades the supply chain has grown longer, more complex and more centralised. More than 80% of us depend on supermarkets for our food, and the food must first travel from farm to distribution centre to supermarket, distances of thousands of kilometres. In the whole supply chain, Australia holds only five days of fresh food, two weeks of chilled goods, and a month of dried goods. But the book is not about scaring you. Apart from sensible ideas about having an Emergency Pantry List, and growing some food in your own backyard or a community garden, it offers a wealth of ideas that build on people’s capacity to cope and to be resilient. What that kept me reading after I read the introduction was that the first chapter was about people, and how they react to threats. The Handbook addresses the psychological issues from the outset: it observes that people dismiss threats or become paralysed with fear and do nothing, and offers suggestions for how to prepare your mind to deal with the inevitable. In my last years at school before my retirement, I had responsibility for Emergency Management Planning. As luck would have it I was Acting Assistant Principal during the term that the education department, in the wake of the Black Saturday bushfires, was insisting that all schools update their Disaster Plans. We didn’t have a Disaster Plan, and we had only ever had desultory evacuation drills, not any other kind. And although I was working in a school on the urban fringe 1000 metres from a national park to the north and 500 metres from bushland to the west, I lived 25 kilometres away in the safety of the southern suburbs and the thought of bushfire planning hadn’t entered my head. I did not know that embers can blow up to 15km to land on a school’s roof and start a fire in the building. To say that I was on a steep learning curve is a bit of an understatement. But one of my enduring achievements at that school was to make sure that every staff member understood the risk, and that we were not only prepared, we had drilled for every conceivable eventuality. And when our planning was eventually tested in the real, when there was a bomb threat, we had 400 kids and 50 adults safely outside in three minutes, and crucially, there was no panic. At the subsequent debriefing, the police told us that they had never encountered a school so capable and calm. At the subsequent staff meeting, I was amused to find that there had been some muttering about ‘Lisa inflicting a drill on us just at home time’, some staff had not known that it wasn’t a drill! (If you’ve got kids at school, I bet you’re wondering how their school would get on. Ask your kids if they have different kinds of drills, and if you’re not satisfied by what they say, go and ask nicely about it. Offer to help, you’ll learn things that may save your life or your home). 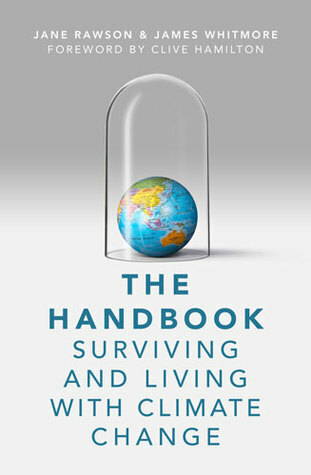 The Handbook, however, isn’t just about the day/s of the disaster, it’s about the aftermath. Yes, you need to do things now so that you can survive the next heatwave without your air-conditioner because the power supply hasn’t coped with a week of 45° temperatures. You’ll need to be prepared in case you have to come up with meals that don’t rely on electricity for cooking. And if the overnight temperatures are going to hover around 25-30° (like they did in Melbourne in 2013-4) you need to have a cool space somewhere in your house so that you can sleep. You also need to have a community around you to look out for each other. It’s better, isn’t it, if the hale and hearty venture out to do any desperately needed shopping for medicine than your neighbour who’s got to take small children in her less reliable car? It’s important, isn’t it, that somebody checks on that batty old lady who lives alone in your street? But you also need to take care of that community afterwards, to support each other in the recovery phase and to learn from the disaster as well. Have you checked with your local council that they have made provision for the homeless in extreme weather conditions? I have. I asked them last summer, and was pleased to find that they were ahead of me. The Handbook makes a point of addressing inequity: they have suggestions for things that you can do on the cheap and is hard-headed about how the rich will inevitably cope better than the rest of us. If Tasmania and New Zealand look as if they’re going to be more congenial places to live as temperatures rise, you can bet that Gina Rinehart and Co have already got their eco-survival mansions sorted, probably in gated communities, thereby putting that real estate option out of the reach of the rest of us. (Well, maybe not Gina, she’s said to be a climate change denier. 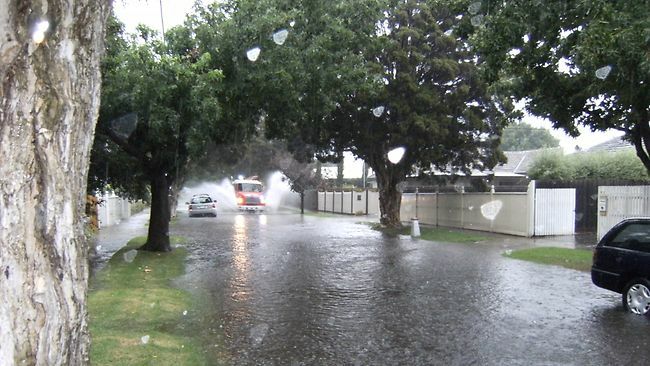 I also haven’t given enough thought to flash flooding which last came to my place with a huge storm in 2011. It paralysed traffic on my terrifying route home from work and made wellies a necessity in my street and my back garden. My vegetables are in raised beds so they would be ok, but where did I put my wellies after they dried out? And have we had the gutters cleared this year, so that they can cope with an overwhelming onrush of water? One of our three water tanks (the first one, the one that wasn’t installed by a plumber) doesn’t have an overflow valve, where will the water go if it overflows? Will a sudden rush of water knock over the nearby fence so that my precious dog could go exploring into hostile new territory? Or will it dislodge the adjacent tree so that it crashes into the shed and breaks the windows, shedding glass everywhere for unwary paws? Maybe I should retrofit the valve, eh? Get the book, read it, and make yourself a manageable plan. Don’t do it on your own, your best asset is other people! In 50 years’ time, as the world swelters, crops fail, bushfires rage and extreme weather causes devastation around the globe, the Dirty Dozen are the people who should be remembered for their role in allowing it to happen. Perhaps primary schools could bury this list in time capsules to be excavated in 2100, just so future generations will not forget what they did. I’ve posted this on my facebook page hoping and trusting all my family and friends read and act on the advice in this important, not to say vital, book. Great review Lisa … I heard the interview too. They came across as so reasonable and practical, but passionate as well. I’ve shared on Facebook too.